celebrating randomness: bacon for babies? What is with this obsession with bacon? I've seen bacon scarves, bacon band-aids, bacon tape and even bacon wrapping paper. They even have bacon salt (a "zero calorie, zero fat, vegtarian and kosher seasoning that makes everything taste like bacon) and no-longer-available bacon flash drives. 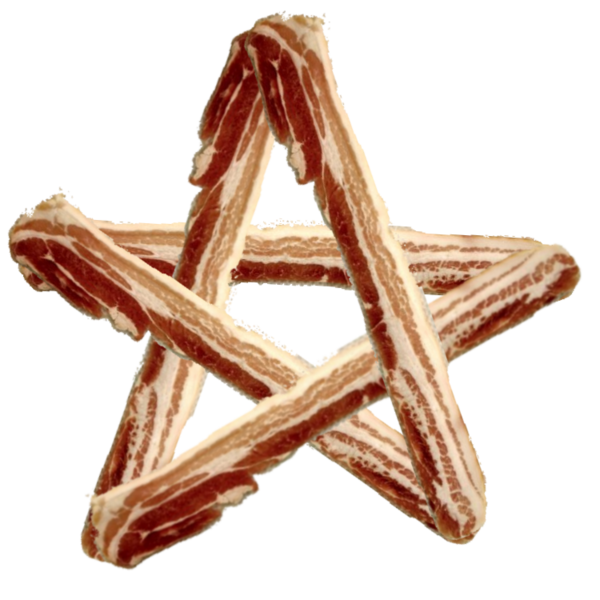 The site Archie McPhee sells 20 bacon-related products! UPDATE 4/23/10 On ThinkGeek today, I ran across a cute (?!) bacon shirt- "three strips of bacon coated in glitter on a black babydoll (fitted) t-shirt"
On April 1st, J&D's, the company already responsible for bacon flavored salt, envelopes and lip balm, announced that they were releasing... bacon flavored baby formula! However, on April 5, J&D's wrote a blog post, exposing their hoax. There is no bacon flavored baby formula. However, a lot of people were fooled, including a news network and the Huffington Post! I love bacon but I'll wait for my baby to appreciate it when she grows permanent tooth. By that time, we'll raid ham and bacon melbourne small goods and enjoy them in due time. What's with the bacon-hype these days, anyway?